I had the chance to sit down with SGC Founder, Director and Pro Mountain Biker Andrew Shandro this morning. He was kind enough to answer a few questions about his week-long mountain bike camps in Whistler, BC. 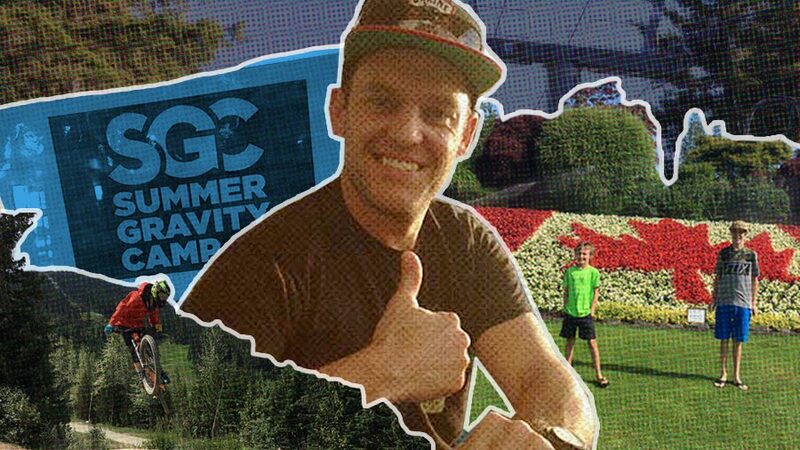 SGC stands for Summer Gravity Camps and sessions have been taking place throughout the summer at the Whistler Bike Park since 2002. Riders come from all over the planet to get coached by some of the best mountain bikers in the world at this extraordinary venue. Why did you start SGC? How does SGC differ from the camps/lessons offered by the bike park? The coaching is amazing, obviously. I think we just bring a different sort of vibe and environment to it. I think we’re just a little more loose. I mean we’re with these kids for a week, so we can’t be serious every day. We do a lot of coaching, but we always have a lot of fun. To a lot of these kids, it’s like a dream to be here just riding – riding with Kyle [Norbraten], and Aggy [Graham Aggasiz] (who were also at the table with us), and the rest of the coaches. So we’re here to have fun. We do our own thing a little bit. Who’s a good fit for SGC as far as age and/or riding ability? We take any ability. It’s easy to get intimidated by the Whistler Bike Park, but there’s a lot of trails in the bike park where you can be a beginner. I wouldn’t say we take full beginners. It’s not the best camp if you’ve never ridden a mountain bike. But, certainly, we take people that don’t have a lot of mountain bike experience. In terms of age, we’re seeing younger kids come just because they’ve progressed a lot with mountain biking, in terms of the bikes a little bit, and the accessibility of these bikes. These kids have progressed so much in a short period of time, so we’re seeing younger kids come. Most kids are between 15 to 18, but we can take younger kids in the program. What do you like best about running SGC? I truly like kids. It’s work, but it’s fun. I enjoy it. I love being at Whistler. We stay up here as a family. There’s so many positives on what we’re exposing these kids to and providing them with all these experiences. I never had those experiences growing up. And I see how incredibly stoked these kids are after a day or two for riding again or just riding with the coaches. It’s truly impactful, actually. And that’s true for the adults too; The adults come here and they’re like, “I can’t believe how much we’ve improved. I never thought I would improve that much during the week.” A lot of people don’t get mountain bike instruction. It’s pretty rare, actually. Adults have all these bad habits. We’ve got to break them down a little bit. How has SGC evolved over the last few years? Has anything major changed? We have three youth weeks and two adult weeks. Before we only did youth weeks. We added an Enduro Camp within one of the weeks. About enduro – I mean really it’s just mountain biking, but people come with their Enduro bikes and trail bikes. We do progression stuff, and then we’ll go ahead and ride the valley trails in the afternoon. Obviously, I can’t do it without the coaches and the staff. I mean Melissa and Trish (the camp “moms”) do an amazing job. They organize the crew. It’s just sort of a team effort here, for sure. Thanks to Andrew, Trish, Mel, and all the coaches and staff at Summer Gravity Camps. This program isn’t just unique — it’s regarded as one of the best mountain bike experiences available. SGC would like to thank the following sponsors for helping make what they do possible: Trek, Dakine, Fox, JBL, Odi Grips, Zee/Shimano, Bontrager, Adidas, Clif Bar, Whistler Mountain Bike Park, Atlas Brace Technologies, Bell Helmets, Muc-Off.